The first 'Intergalactic spacewar olympics' will be held here, Wednesday 19 October, 2000 hours. First prize will be a year's subscription to "Rolling Stone". The gala event will be reported by Stone Sports reporter Stewart Brand & photographed by Annie Liebowitz. Free Beer! Today, Oct. 19, is the anniversary of the world's first video game tournament. 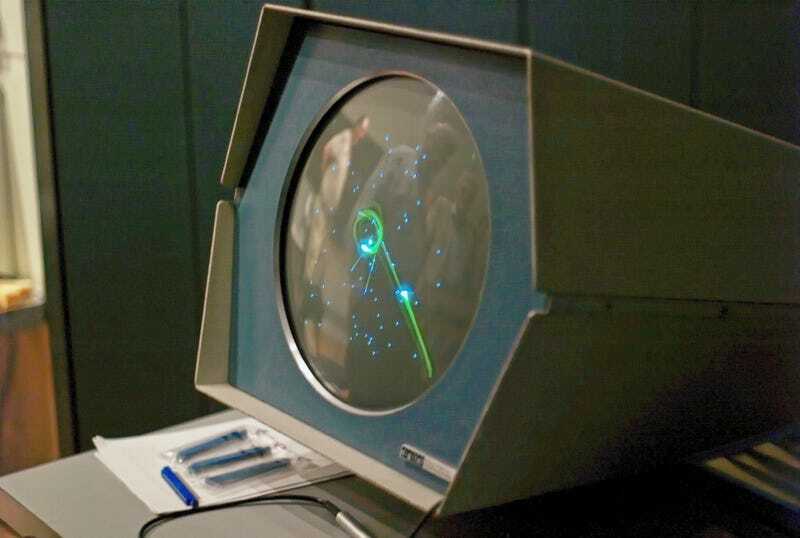 Spacewar!, principally developed by Steve Russell, with help from five colleagues at the Massachusetts Institute of Technology, served as the field of competition. The program had been a lab favorite across the United States and Canada for 11 years. Reliably, at any nighttime moment (i.e. non-business hours) in North America hundreds of computer technicians are effectively out of their bodies, locked in life-or-death space combat computer-projected onto cathode ray tube display screens, for hours at a time, ruining their eyes, numbing their fingers in frenzied mashing of control buttons, joyously slaying their friend and wasting their employers' valuable computer time. Something basic is going on. Someone got the idea to convene the "Intergalactic Spacewar Olympics" in 1972, at Stanford's Artificial Intelligence Laboratory. Contestants fought it out on the lab's only PDP-10 computer. Two events were held: A five-man free-for-all, and a team competition. In Spacewar!, five distinctively rendered vessels (nicknamed "Pointy Fins," "Roundback," "Birdie," "Funny Fins," and "Flatback") fought it out in an arena dominated by a star, whose gravitational pull drew them to the center. Up to four hazards (mines) could be strewn on the playing space. Each ship fired torpedoes; a standard game gave them twin tubes. The inaugural Intergalactic Spacewar Olympics allowed them only one. Slim Tovar and Robert E. Maas won the team competition. Bruce Baumgart won the free-for-all. A reprinting of Brand's article supplies all of the details here. Spacewar as a parable is almost too pat. It was the illegitimate child of the marrying of computers and graphic displays. It was part of no one's grand scheme. It served no grand theory. It was the enthusiasm of irresponsible youngsters. It was disreputably competitive ("You killed me, Tovar!"). It was an administrative headache. It was merely delightful. Today, you can still play Spacewar! on a PDP-1—the game's original platform—a few miles down the 101 in Mountain View, Calif., at the Computer History Museum. Russell himself is often on hand to give a demonstration of the game and discuss its design. The Computer History Museum opens up its PDP-1 for Spacewar! play on the first and third Saturdays of the month (tomorrow is one) between 3 and 3:30 p.m. I played Spacewar! there in 2006 with my brother, with Russell leading the demonstration. I highly recommend making this visit, to anyone interested in video games and their history. With thanks to Walter Day and Video Game Trading Cards.